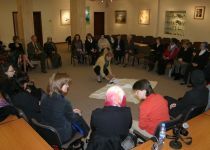 European Project for Interreligious Learning is a program of interreligious education in Europe, with a primary focus on dialogue between Christian and Muslim women. While the main emphasis of EPIL’s activity is Europe, it remain open to cooperation with partners from other continents. You can become EPIL participant by filling in the application form for the new Study Course. Want to be informed about EPIL? Add your mail and we will inform you about our projects, news, etc.